Is it ok to run ac duct from top of plenum? No, this is code violation. Is there stack duct for 6" wall? Yes, you can use a regular 6" oval stack. How do you seal ductwork with silver tape? If this is old ductwork do not use silver tape, use a duct sealer. How to install dryer vent through brick video. C'mon, just look at these pictures on the "Split Level Ranch" page, it's more than enough! Why am I having microwave vent hood exterior exhaust issues? The simple answer: because you still trying to save a couple of bucks on my paid page. What are the causes of sweating air ducts in a crawlspace? Jus read on this page and find the answer. Why does furnace bang constantly? There are a lot of causes for that, just read it on this page. Does it pay to replace ac ductwork? If it's very old, rusty and dirty outside and inside, if it's undersized or oversized, then the answer is yes. Do you cover outside vents for intruders for furnace gas vents? Yes, there are some metal or plastic screens available at the supply houses. Is there bathroom residential wall mounted exhaust duct fans? You can use just the regular one; see pictures of the installation on the "Top of the Line House" page. What is the best cold air intake basement position? 6 - 8 inches off the floor. Where I can find furnace free book install? You already got one - it is your furnace's installation manual! Could dripping noise in wall be coming from humidifier? Does an 80 percent furnace have to have a double walled vent in a crawl space? How often should ductwork in the attic be replaced? Well, if it deteriorated beyond repair then it should be replaced. Are flex ducts hung from attic rafters? Can I eliminate some cold air returns in a manufactured home? If you eliminate them in one part of a house you have to make them in another. Can I put a cold air return for the basement in the floor joist pocket with thermo pan? Can I run PVC exhaust for my furnace that has regular galvanized stove pipe? Can I use flexible 6" duct work in a 2x4 wall? Can undersized supply ducts cause a furnace to short cycle? Can you block off air intake to hot water heater? Can you cut a cold air return on both sides of the wall? Yes and no. Yes, in the case if both rooms have the same privacy level. Can you do anything to stop sound in air ducts? Insulate them on the inside. Can you hook up a 4 inch exhaust fan duct to an 8 inch piece of duct already through the roof not being used? Yes. But for the flat roof an 8” piece cannot be sticking out of flashing. Can you use your whole basement as a return cold duct for furnace? Can you vent a dryer down thru the floor? It will overheat (overcool) the rest of a house. Do it yourself ductwork installation download DVD? DVD is a stupid idea because you can use it for basic installations only. Do microwaves with vent hoods take air outside or recycle in house? Do they make furnace air filters that whistle when dirty? Are there advantages and/or disadvantages of building on slab versus on crawl space or basement? There are many different issues to consider when it comes to the choice of a basement, crawl space, or a slab foundation for your new home. In many parts of the country, full basements will be the norm, while others will have slab foundations and still others will have crawl spaces. This is simply a value / price perception issue since many people feel that having a full basement gives them more room even if it is used only for storage purposes. Moreover, of course, the potential is always there for someone to finish the basement and add extra living space at some time in the future. Slabs are very popular in warm climates and also in areas with lots of rock. If there is no basement, the wiring and the plumbing will be in the walls or in the ceilings. Space will also be required for the furnace and the water heater within the house. Water pipes must be insulated especially if they are in the attic. One major advantage of slab foundations is that there is little chance for water and outside gases to leak in providing a healthier environment. Also slabs are lower to the ground as a rule and they have fewer steps to go up which can be an advantage for older seniors or people who have difficulty in climbing stairs. There are several potential drawbacks to slab foundations. Any cracks can cause long-term problems and are more difficult to repair. Soil movement, tree roots can lead to cracks in the slab. Slabs homes are also more prone to insect problems. When it comes to the ductwork installation there could be some advantages and disadvantages. Considering that in some instances building a basement isn't a feasible option that I would recommend for installation of the underground ductwork. Relatively recently instead of spiral metal pipes some companies started to use plastic ones, which have infinitude lifetime and built-in insulation. Other than that, personally, I consider building a house on a slab as a crime! Why that? Because in the most cases house on a slab has heating/cooling equipment in the attic and this creates multiple problems. 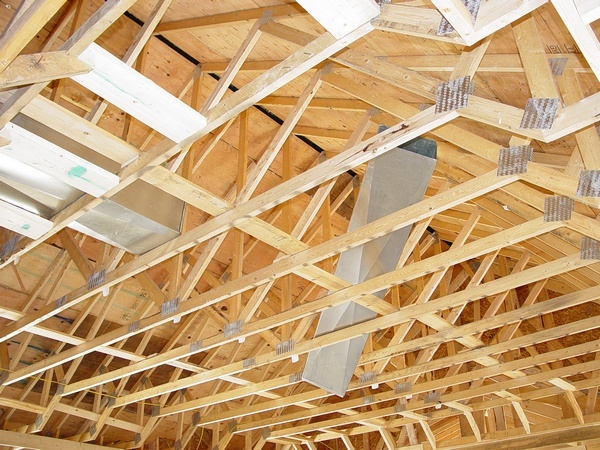 Read more on the "Ductwork in Attic" page. Crawl spaces need to be insulated and protected from the elements in the colder climates. Warm climates tend to have semi-open crawl spaces, which are a place for moisture, mould and rodents to collect. There are a number of health issues that can be aggravated by moisture and mold. A crawlspace foundation is where the home is supported off of the ground level by approximately 2 feet. Stem walls extend from the footings around the perimeter of the foundation to support the home. Often times an alternative is used instead of the stem wall. This is called pier and beam. This is a system piers, which are a formation of rebar that are placed in holes and filled with concrete, that are tied into beams that will form a similar stem wall to support the home above. Crawlspaces are typically used in areas with high moisture, where excessive water can build up. Supporting the home off of the ground keeps it away from moisture that could cause damage. When it comes to the ductwork installation, building a house on a crawl space is a crime, hands down! It is even worse than ductwork installation in attic! Why that? Because a crawl space, and especially a shallow one, is barely reachable for installation and maintenance purposes. Installers in the crawl spaces would never able to do the job properly because of the working conditions they must work in. Mechanical inspector who in the most cases is a retired heating contractor would never crawl in space like this unless a homeowner is a CPR certified and all the money saved on a concrete slab and walls will be wasted on higher prices of heating/plumbing/electrical installations and future repairs and maintenance. Look at this photo on the left. There are two houses, side-by-side, built on the low ground on the lake's shore. House to the left sits on the shallow crawl space, and house to the right on the full size basement. A wise builder built house to the right, but a moron, whose main goal was to safe a few bucks built house to the lift. Ironically that house was burned down to the ground, but they rebuilt it the way it was before!?! Here is an example of professional crawl space furnace installation. Basements are the most expensive of the three foundations to build. More labor is required to excavate the site, pouring the walls or setting the concrete blocks, and a basement is going to use more materials. A basement is also going to take more time to build. This is due to the added amount of work and the extra time needed to let all of the concrete set. An average basement will take 2-3 days to pour the concrete and up to a week to set. Basements tend to be cooler which can be important in hot climates, they add value to the home and provide more room whether finished or not. Basements tend to be more expensive due to the footings and walls that must go below the frost line. Drainage is very important for basements and crawl spaces – as you don’t want water in these areas. Slabs and crawl spaces are generally less expensive than full basements to build, especially in conditions were there is a great deal of rock to be removed. In some locations it is almost impossible to install a basement without the large expense of removing solid rock. When it comes to the ductwork installation, the basement is the best place for your heating and cooling equipment. It would provide a necessary space for your almost entire ductwork system. Convenient overhead location allows easy access to all its elements, which contributes to easy installation, repairs and maintenance. Below you can see some pictures taken from my "Ductwork Installation Guide" that show you how heating/cooling equipment, ductwork and some ductwork/venting elements should be installed. Upon completion of all ductwork installation do the venting (Chapter #49).